Thick and colorful hair, pronounced bone structure, athletic and toned build, bronzed skin … and pearly white teeth. The American conceptions of beauty, healthfulness, status and degree of power can exist without the former four qualities, but the lack of white teeth is rarely seen in popular culture. 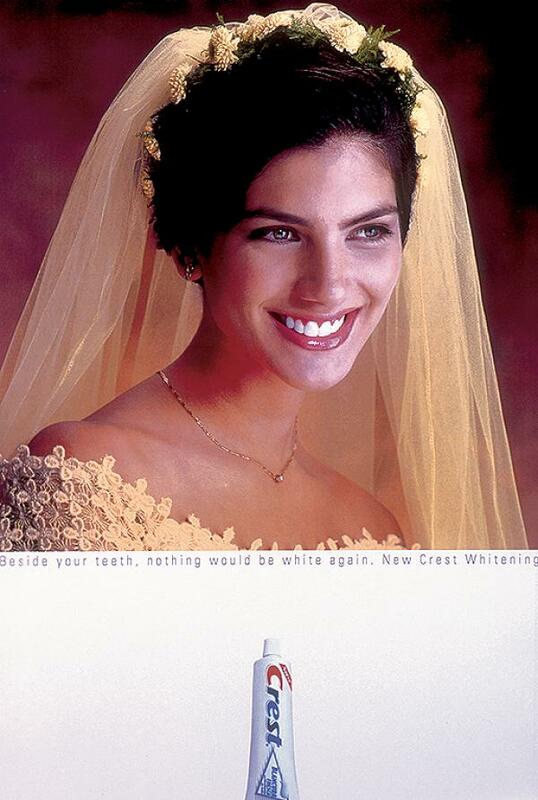 The caption on the advertisement of the veiled woman above states, “Besides your teeth, nothing would be white again.” The ad appears to focus on self-worth over materialism by accentuating light on her mouth, drawing attention away from the wedding garb and instead focusing on her “natural” features. The whiteness shines through the picture’s photograph style sepia, an implication its results last through time, and should always be remembered. It is her smile and luminous teeth, not the wedding dress, that appropriate the importance of her advertised moment, and in turn, advertised memory. But her beauty, her uniqueness and purity, at the above moment, are only resultant features of Crest usage. The company takes credit for the enhancement of her beauty, the purification of her image. At once, she is born again into the new life of marriage, with the same whiteness of her youth. No matter the good or bad to come, Crest tells us, she’ll always have that memory. “Will you?” they ask. And another customer is gained. But what makes the consumer crave white teeth? Healthy teeth have a yellowish tint from the color of the tissue underlying the enamel, undermining the chance of a naturalistic bent. While toothpastes broadcast “whitening” alongside “cavity prevention” and “gingivitis protection,” its benefits are not clinically required or recommended in cases other than aesthetic/physical “improvement.” Furthermore, toothpaste tubes and containers don’t even list the function of whitening under “Uses,” instead referring to it in the “Other Information” section, stating “stannous fluoride may produce surface staining of the teeth, adequate toothbrushing may prevent these stains which are not harmful or permanent.” “Whitening” then is unnatural, manufactured and recognized by production companies as a “not harmful or permanent” staining of teeth. But the woman in the advertisement realized she needed Crest Whitening to look her best, being intrinsically inadequate without radiant teeth. Roland Barthes in his essay Myth Today states, “myth has…a double function: it points out and it notifies, it makes us understand something and it imposes it on us(265).” The endorsement “notifies” us of the imperfection “yellow” connotes in modern culture, and “imposes” on us the need to change ourselves(luckily also introducing the product that will grant this change). Barthes later states, “myth is experienced as innocent speech: not because its intentions are hidden – if they were they could not be efficacious – but because they are naturalized(Barthes, 268).” The signified “healthy teeth” has fostered the false signifier of “white teeth,” which is catalyzed and perpetuated by celebrity and common culture that champions notion of “white” as ideal. The normalization of this false signifier blankets dental advertising campaigns, strengthening its mythic function by affecting consumer self-perception. The myth’s signification compares the fabricated white to natural yellowness, which becomes vilified as unattractive and an indicator of subpar personal hygiene and lower status. The “yellow tooth condition”(broadcasted as an ailment with severity comparable to cavities and gingivitis) requires direct action to “resolve,” as it will persist even with the use of normal toothpaste, i.e. persist naturally. This creates reliance on consumerism to achieve the accepted “norm” for cleanly and appealing teeth. Is the appeal of whiteness intrinsic, or does the appeal draw associations from divinity as white and deathly/devilish as tainted and black? Or maybe the appeal is an evolution of the antiquated practice of swallowing arsenic to foster pale skin, honing focus on the face in modernity, rather than the entire body, to more effectively broadcast “perfection” through a celebrity’s most recognizable and advertisable physical feature. This hypothesis would involve the discussion of dark, bronzed skin and its increase in appeal through the last century. It is evident that the myth creates insecurity in the consumer that was not preexisting to compel sales, but a full discussion of its origin and further cultural implications would require a more involved and researched paper. using the FDA statements on a Crest Clinical 3D Whitening Toothpaste tube, which seem vague enough to apply to any whitening toothpaste product; this an assumption-I know, bad. LOVE this, and we’ll return to these same understandings of whiteness when we talk about race and semiotics later in the semester. I especially love how you point out that whitening really has no actual health benefit — and is not, in fact, recommended — save for our own need to comply to the Myth. And that ad is just horrifying. This is awesome. A perfect example of not only myth, and how it’s ingrained into us as natural rather than societally constructed, but also by how advertisers create markets by producing the want in addition to displaying the solution for that want. I think it’s also important that the advertisers align themselves with marriage, another preexisting myth, which could be further deconstructed to enhance your argument if you ever expanded on this idea.